Perhaps it is a great idea, but surely, labelling where we live, shop or eat and have coffee by our disease or condition, is simply another form of keeping the myths alive, as well as ensuring a continued sense of ‘otherness’. It is definitely another form of segregation. And yet, the emergence of Dementia Villages, or Dementia specific Cafes’ and Shopping Lanes has been taking off in the last few years. 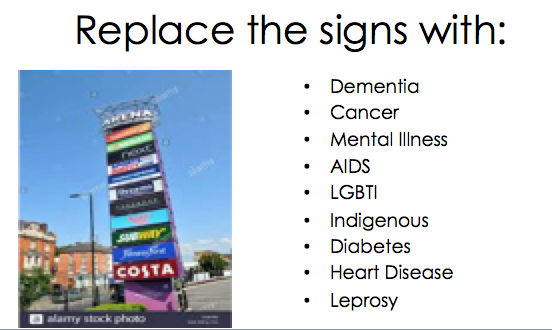 One can only imagine the (justifiable) outrage if we replaced the names of the stores in a shopping centre with diseases or specific groups of people, such as Indigenous, and make them exclusive to those groups. Therefore, I wonder, are these new ‘villages’ being built around the world for people with dementia to live in, are simply another very expensive band-aid for a broken system, and a system where staff who are not adequately educated in dementia are still allowed to ‘care’ for us? In an article, The Dutch Village Where Everyone Has Dementia, they start by saying ‘The town of Hogeway, outside Amsterdam, is a Truman Show-style nursing home.’ Often I am asked to provide an opinion for an article or blog being written by someone about dementia villages, and so far, I have refused to give a firm opinion on them, other than to say, ‘I’m not sure, as I have never visited one personally. Hogewey was primarily funded by the Dutch government and cost slightly more than $25 million to build. So, if you’ve been reading my blogs for a while now, you might have guessed that I’ve now formed an opinion on them, although I do admit, still without visiting any of them! Frankly, I do believe it is simply another form of segregation; probably still with poorly trained care staff (awareness of dementia is not adequate), with more impressive ‘dressings’ or ‘mayonnaise’? Interestingly, a couple of weeks, I whilst attending a zoom meeting with some Japanese friends, two of whom ar diagnosed with dementia, they agreed with me. Imagine if the Dutch government (or if my government!!) had invested $25 million into improving the education of all health care professionals (HCP’s) in dementia? Perhaps then, we wouldn’t need to find a more palatable way to segregate people with dementia. Currently, my government is intending to spend $101 million on ‘Secure Dementia Care Units, whilst it has not committed to adequately educating the staff who work there. The one thing really missing in the whole dementia space is adequate education of Health Care Professionals (HCP’s), including medical and nursing staff, and yet, we continue to participate in surveys and submissions, or receive requests to become advisors to an emerging new business or dementia village, without thinking about the bigger picture, or fixing the problem at the source. Many with dementia, and now even some people without dementia are lobbying for the phasing out of secure dementia units and institutional care, as we know from experience, it almost certainly results in worse care. Orphanages proved that years ago! Thought provoking, and as always your perspective is definitely something that we must ponder. You enlighten us and inspire us with everything you say, and it always makes me sit back and look at the existing paradigms and question them in more depth. If this is just taking segregation and ostracism of people living with dementia to a much larger scale, then I agree with you that this is definitely not the answer. If it is a solution in which continues life and integration however, with additional support for those that are more vulnerable, then this type of scenario may be possible. It could promote a supportive environment consisting of entire communities, with people living with dementia as the experts, providing us with the skills to understand their needs. The community, medical professionals and people living with dementia need to “work together” to ensure an educated approach based on understanding and meeting the needs of our population. I totally agree that unless we have a more educated community, health care professionals and care partners, then no matter what is developed, it shall not be successful. Knowledge is without doubt an area still sorely lacking. This should without doubt be the starting point. As we have been discussing lately, current solutions continue to be created STILL based on the old archaic stigma and stereotypes about people living with dementia, and until this has been reversed through education, compassion and empathy, all solutions will continue to be based on subjective, cognitive viewpoints. Change of attitude shall promote a change in how we perceive dementia and thus enable a person living with dementia to continue living a full and meaningful life, unhampered by the restraints we can so thoughtlessly place on them. Cheers darling, and thank you – let me know when you are free for a chat. Back on board with all guns blazing. I totally agree with you in regards to a lot of the “dementia friendly” ideas that are emerging. I am open about my diagnosis but have no intention of standing in a dementia friendly line at the bank or supermarket (unless it’s the short one and I can jump the queues 😉); however I see the villages in a different light. I live alone and care for myself; as I become less able to manage independently, I hope to be able to draw on services to remain in my own home for as long as is practical. BUT….I am conscious that there may come a time when it is not safe for me to be home alone (i am not in a position to pay for 24 hour home support) and so a nursing home will be my only option. The idea of living in an open village where I can experience the feeling of a “normal” life is preferable to me than any of the existing nursing homes (locked unit or not), however good they feel they are! I want to retain my sense of independence and control (vital for me!) and feel that this is the best option available. Thanks for your continued fight which gives us all the opportunity fir a viewpoint. Thanks Kate. To be honest, I’m really not sure. I hate the idea of being ‘in care’ full stop. I have always been an extremely independent woman. I defintely don’t want to be locked up in a traditional unit, dementia specific or with other members of the community, without dementia. At this point it feels like the ‘village’ concept would give a greater sense of freedom with the ability to move about and do everyday tasks with a sense of normality, once I am at a stage where it is not safe for me to be home alone. It feels less like segregation and more like protection. I don’t want to set my house on fire from my dangerous ‘over-cooking’ antics, nor do I want to step out into the road without checking and cause an accident, injuring myself or others. ….but I do still want to cook and go out alone, when I want to (with discreet supervision). I don’t think this can happen out in the community. Great points… although I still question, if our community was able to support us, would you prefer to live in a ‘mixed’ community, or still prefer a segregated one? A mixed Community would be great….an open community, too risky for the reasons I mentioned previously. I agree that being negatively labelled is unacceptable, but requiring a level of supervision for personal safety is a necessity. These safe communities would ideally be open to everyone but unless I am missing something the only people who would choose to have that level of security would be people with dementia and their families. Do you gave a different vision of how we could be protected, Kate? I think if society was applying the full intent of human rights Conventions, such as the Conventions on the Rights of Persons with Disabilities (CRPD) fully, we would all be safe to live in our communities. Sadly, the CRPD has been ignored for too long to make it possible. Not sure if that makes sense? I agree with you wholeheartedly, on this, Kate. Dementia or not – we are all different! I fully agree I would never want to leave the home or area I have lived in all my life I know it inside out. I walk around in the dark sometimes, without problems. If I was put into a nursing home or dementia village with locked doors I would deteriorate rapidly because what these people forget is familiarity and routine are the two things that have helped me to live well with this disease but I hate being treated differently to other people with seen and unseen disabilities. All I want in life even when I can’t look after myself, is like the help I have now from friends and family, which is care given with love and affection. I would hate to be locked up like a criminal. You see so many TV programmes where people with dementia are abused. Some people in the area where I live who are also living with dementia are fighting for these type of villages but to me this is definitely not what I would want. It’s like saying we all need putting together and locked away supposedly to keep us safe and those on the outside safe from us. This can’t and shouldn’t happen. Thanks for letting me know – also, I deleted it from your public comment for your personal security Evelaine, as I can see it privately. We need to make all spaces disabled and dementia friendly, not segregate places so “normal” people aren’t bothered by either having us around or seeing the environments and aids we need… all of us are normal too, challenged, but normal. The environments with which you are familiar are best for dementia, and with disability, why should anyone be excluded from the same places anyone else can go? I’ve got a wheelchair, not the plague. These ideas seem to fly in the face of the current thinking around inclusion, person-centredness and living in the community. In some ways we don’t seem to have moved on very far from the old days when people with cognitive or mental health issues were locked up and the public could pay to gawp at them on a Sunday afternoon. My priority is understanding dementia and lessening its impact, so that people can live a life that feels normal, with any support they require being provided as inconspicuously as possible. The customer services manager of my local supermarket pointed out that special shopping lanes aren’t needed if the assistants are sensitive and if staff manage any queue building behind them by diverting people to another till. Whether the issue is cognition or arthritic joints, it’s much easier to sort out your money if you don’t feel that you’re holding anyone up. You are so right! We have just given the same or new forms of segregation ‘nicer’ names! Eg a secure dementia unit, is now called a ‘memory support unit’. Still jail, just a new label! My experience is as a Nurse working with staff/patients living in Dementia “units” located within an extended care facility or an entirely dementia facility. Vermont, US has a long term Medicaid program to assist patients stay at home with support. VA, private funds, other insurance pay for some but not all. Basically, with Dementias, you need A lot of assistance, like an Infant or a Toddler needs.You never know what they’re up to. A Granny Camera only works if there’s someone there to watch and Help. Fragmented families at a loss to cope with failing relative. Or no one left to even do paperwork. Vermont Medicaid has Choices for Care-a good basic model for choice. When it all boils down, Dementia units can be the Best place. Look at private pay The Arbors in Shelburne, Vermont or the Converse Home in Burlington, Vermont or public and private funded Dementia unit at Birchwood Terrace Burlington, Vermont. Specialized staff, Locked units with “soft” approach-switches hidden, wandering paths, structured programs. Special staff (worth saying twice-it’s the people. Small group care homes can manage to a point. If extreme behaviors emerge or patient needs change, planning should include where can the best care be provided. My story of Vermont’s long term care program: https://traveloguefortheuniverse.blogspot.com/2010/08/case-management-in-robert-frost-country.html Go visit a good facility… seems weird, but segregation can be good when integrating can mix Vulnerable “Medical “ patients are sometimes unpredictable and confused Dementia patients. Open doors needed for alert patients are dangerous to people with dementia. I do speak from extensive experience. I don’t think “Caregiver” is a disrespectful label. I do think it would be lovely if we could frolic, carefree, in our clean safe home and neighborhood with our wonderful neighbors and family supporting us. Where cars stop when we dart into traffic. There is a predictable tsunami of stress as baby boomers start losing parents to dementia, often feeling Extreme Guilt. Job, Finances, Social Expectations. Parents Refusing any Help, or Oversight. Boomers get diagnosed with Dementia Every Day. Are Their kids going to support them? The Government can’t support them either. You may have to settle for the best there is while you are creating an integrated system where nobody gets hurt. Good luck getting what would be best. Thanks Mary, I respect your experience greatly, and have much as well, on three sides of the dementia spectrum. What I’m questioning is the segregation of people based on an illness, something we stopped doing decades ago for people with mental illness or disabilities. Wow Kate! I really found your post on this enlightening. You’re so right! I absolutely agree about spending money on educating staff across all levels of health care about dementia. I recently worked with a nursing student who was completing her third week of placement within an aged care facility and she had not learnt anything theoretical about dementia before doing so. I found this quite baffling. I also speak about this regularly with my husband who is an emergency nurse practitioner (also with limited understanding about dementia). Since people living with dementia are more likely to stay longer and be readmitted to hospital than those who don’t, it is frustrating that this isn’t a bigger priority for our government. Thanks for your posts. Hopefully, one step at a time, we can all try to make some positive changes that will provide greater support, understanding and care for those in our communities living with dementia. Cheers Kate for allowing us who don’t walk in your shoes to have a deeper sense of how your shoes feel. I found some very useful info in the Assets-based approaches and dementia-friendly communities article that you referred too. Oops meant “lewy” Instead of “leey” and “for now” instead of “for name”. Also, meant “me and your families” instead of “me and yours”. Also meant “around” instead of “round”. Kate, great article and research paper. I don’t understand why someone with a diagnosis of dementia who still has the ability to walk would want to MOVE away from their FAMILIAR home to a NEW home in a mock-village, that they have never lived in. Its illogical to me. People with a dementia who still have abilities like continence, the ability to mobilise and knowing who they and their family are, lose so many of those abilities when they move to a NEW UNFAMILIAR HOME. Even if the village reminds the person of where they once lived – what is more important is the fact that the rug has just been pulled from under the person because their familiar home (layout etc.) has changed. This is a critical change. Quality Dementia Care at Home is what people with dementia say they prefer, over and over and over again. Their abilities are retained for longer and so is their sense of self. A lady with dementia in her 80s who has been living in a Group Home for over 18 months has just returned home with Daughterly Care. She put her arms around our Nurse and whispered into her ear “please bring me home”. Day one of being home the lady walked across the road to her neighbour and proudly announced she was home. He invited her in for morning tea, delighted to see his long time friend. Then she door knocked other neighbours proudly informing them she was home. When the lady gardens, in her garden for 3 hours, she doesn’t have dementia, she is just enjoying gardening. This lady was a Concert Pianist however she was grieving the loss of being able to play the piano. We were told because of her dementia she could no longer read music. Investigation and ENABLING CARE was needed. We found our client plays beautifully with her right hand but due to her macular degeneration, not her dementia, she cannot see the black keys and therefore makes mistakes with her left hand and this is the cause of the problem – poor eye sight, not dementia – albeit dementia meant our client couldn’t tell us what the problem was – we had to figure that out..
We provided a Caregiver/ Support Worker who is a Qualified Piano Teacher who visits several times a week. She plays the left hand of the music and our client plays the right hand. Together they play beautiful music. Our client considers herself the Piano Teacher of the Caregiver and has great self esteem from teaching her so well.. Our client IS teaching our Caregiver, not how to play the piano, but about the ability to LIVE WELL with dementia when you have a supportive family and Enabling Creative Care Provider who look for SOLUTIONS to the unique needs you have. This is what people with dementia need, enabling support that is unique to them and to stay in their familiar home, not a mock-village. Perhaps I need to go on a tour? After 20 years of supporting people with a dementia, I think not. Brilliant and thought provoking Kate S! Care homes should not exist at all without enabling care as Kate Lambert says – it’s the very basis of living better with dementia. “Trapped” is what I see in the eyes of many of our care home residents here in the UK, deprivation of liberty and of the very essence of living a fulfilled life. People feeling trapped – on top of dementia – horrific. Rarely, if at all, even smelling fresh air, feeling grass under their feet or speaking to another human being. Years ago I stated that people would be better looked after in prisons and nothing has changed since then. With better training for care staff but, more importantly, training and legislation for owners of care homes all could be different. There are some people who have no-one left in their family to care for them and the way social services are run here there will be no alternative. Whether in “care” or at home, preventing deprivation of liberty and enabling comes at a price. Once again it comes down to money but freedom to live in this lovely world and not be “trapped” should be a given. I have always thought the term “dementia friendly” gives out the wrong signals too – maybe we should say ” inclusive communities” instead? Now that’s what I call real person-centred care… And teasing out what is due to the dementia itself and what is actually an eyesight problem made more difficult to cope with by the dementia interfering with the person’s normal coping strategies is SO important. It’s not just the dementia affecting her eyesight – it’s more complicated than that. And your client may well be teaching the caregiver about playing the piano too. Even a piano teacher can learn from playing duets with a concert pianist. People with dementia aren’t often given the chance to share their skills and knowledge so this is very precious.